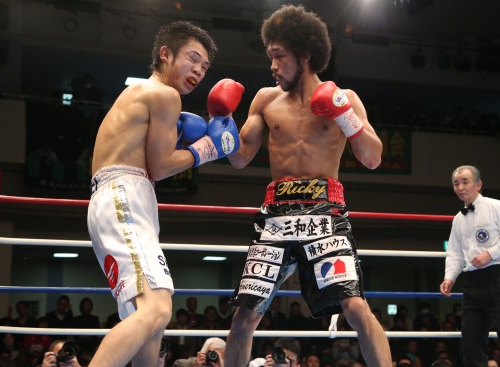 Usui secures 5th round TKO win against Matsuzaki! Earlier today Japanese fans at the Korakuen Hall, and those who use a-sign boxing, had the chance to see Japanese ranked Super Bantamweight Kinshiro Usui (27-4, 11) [臼井 欽士郎] claim a 5th round TKO win against former multi-time Japanese title challenger Hiroyasu Matsuzaki (22-8-2, 11) [松崎 博保]. Usui looked the fresher and hungrier fighter from the off, often forcing Matsuzaki on to the backfoot and. Although Usui looked hungry Matsuzaki did show his experience and forced Usui on to the retreat at times, though Usui seemed happy to hold his own and bide his time when he had to. In round 4 it seemed like Matsuzaki was was starting to slow down and struggling with the pace he was trying to set, showing signs of having been out of the ring for close to 3 years, and was although he seemed brave he wasn't really making a mark on Usui who was boxing well on the backfoot. In the opening seconds of round 5 a right hand from Usui dropped Matsuzauki hard and although the former title challenger got to his feet the referee had seen enough, waving off the bout just 20 seconds into the round. The 36 year old Usui will be looking at getting a title fight in 2017, and it seems like it'll be now or never for the Yokohama Hikari. For Matsuzuaki this now has to be the end, with little reason for him to even think about continuing his career. Rikki does it, as he claims Japanese title! Second generation fighter Rikki Naito (9-0, 5) scored the biggest victory of his career earlier today as he stopped Hiroyasu Matsuzaki (22-7-2, 11) and successfully claimed the Japanese Super Featherweight title. Naito, tipped by some as one of Japanese fastest rising prospects, was expected to be given the toughest test of his career by Matsuzaki but instead the 22 year old unbeaten southpaw just cruised through the gears. Naito was too fast, too skilled, too big, too power and simply too good for his game opponent. With Matsuzaki in a deep hole after 8 rounds and being broken down with hard shots to the head and body his corner decided that enough was enough and withdrew their man from the bout to prevent him from taking any more punishment. By then it was obvious their man had no chance and the decision was a good one from a corner who knew that the bout was no longer competitive. For Naito this seems him becoming the second fighter in the family to claim a Japanese national title, following in the footsteps of his father Cassius Naito. Cassius, who held the Japanese title twice in the 1970's later went on to win an OPBF title, may well view his son's victory here as a sign that his training is working excellently. Whilst we wouldn't rush Naito, it's not beyond the realms of possibility that he could claim an OPBF title in the next 12-18 months. Unfortunately however he is in one of the toughest divisions in Japan with the likes of Takashi Uchiyama, Takashi Miura, Daiki Kaneko and Satoshi Hosono also fighting at 130lbs and it may be a while before Naito can break through to being one of the elite Japanese guys in the division.